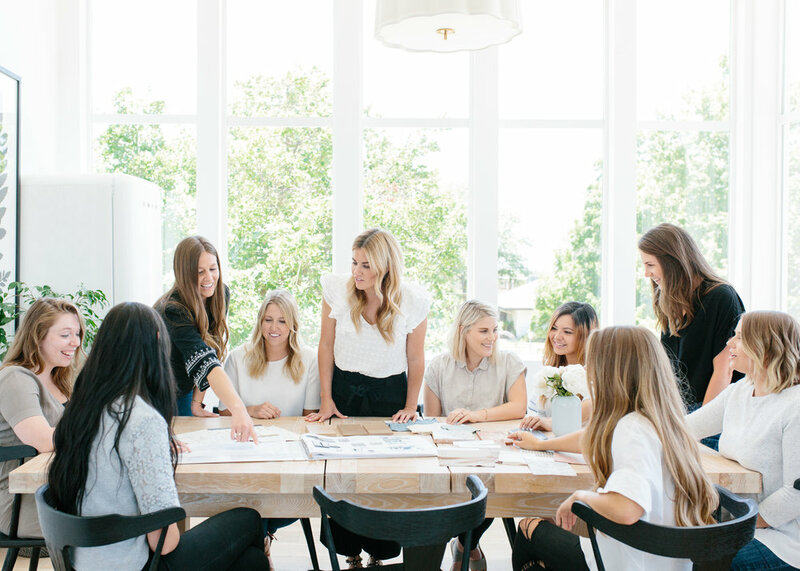 Studio McGee is a full-service interior design firm that designs homes from concept to completion all over the US. We have garnered a reputation for beautifully balanced spaces that feel refreshingly modern and endlessly classic. We create custom interiors for full new builds and renovations that stand the test of time. Based out of Salt Lake City, our team has designed hundreds of projects across 33 states (and counting), which has led us to develop and refine a seamless process to help our clients navigate each step. Our designers collaborate from the floor plan development, interior drawings, custom cabinetry, finishes, and selections: through furniture, window treatments, styling, and turn-key installation. You've seen our finished projects on Instagram and our blog, but what is it like getting there? We are a team of organized designers that conceptualize beautiful homes, but also have the project management skills ready to communicate those ideas with tradespeople visually and over email, calls, and FaceTime. Plus - we're nice!! From warehousing all the items, directing handymen and movers, and even stuffing the pillows, our experienced design team makes sure all the pieces of your home are pulled together. We want you to walk into your freshly designed space and feel instantly at home! From incorporating your requests and personal taste with our style and experience, we communicate and involve you in the decision making process from start to finish of our design service. The designers present a comprehensive overview with your own design binder which includes mood and design boards, detailed graphics and illustrations, and a budget to help you visualize the design and concept of your home. There are hundreds (and sometimes thousands) of items that need to be ordered and managed throughout the home-building and furnishing process. We have developed our own proprietary software to make design service a clearer process for our clients. Our system allows you to see the status of items in production, pricing, links, maintain invoices, and provide feedback every step of the way. This keeps you fully in the loop with the product costs, items you’ve approved for ordering, and your designated ordering specialist. In just a brief amount of time, we have established ourselves as one of the leading design firms in the country for our signature bright, clean, and collected aesthetic. We mix our favorite materials, styles, and eras for a decidedly approachable and sophisticated result. A blend of our signature style with a strong understanding of our clients’ personality and favorite pieces is reflected in each home we design. Shea's vision and hand is evident in each project, but there are a lot of people that help make that vision into a reality! Fill out our form, upload pictures, budget, etc. and we will reach out to you to get a better understanding of the scope of your project and our current availability. If the project is a potential fit, we estimate the number of hours required to complete your project, so you can get an idea of service costs. Once you have signed on, you will be introduced to the 2 designers working on your project. We want to know about your project and your overall style. Whether you love oil paintings or hate the color orange, we want to gain a thorough understanding of your preferences for your home. After the conceptual direction of your home is established, we’ll design and present your home’s finishes—every hard surface detail from doorknobs to the countertops and paint colors. Once the finishes are finalized, we organize and communicate all of that information to your builder. We order tile and lighting, prepare specification sheets, and answer question about implementation along the way. Upon approval of your designs, we begin ordering! We use a proprietary ordering system that we developed in-house to track all invoices and shipments. Our team will even coordinate with your receiving warehouse to make sure that every item is checked for damages. Approximately 4-6 months before the completion of your home, we will present the furniture designs. Often times the design presentation can double as a site visit. Your designer will walk through the site and check the progress of the build or remodel, answer questions, talk with the contractors, and ensure the designs are coming to life as planned. This is the most exciting day of the entire process - after months of construction, this is when your house becomes a home. The movers and handymen arrive first thing in the morning, furniture is placed, artwork is hung, and our team brings in the accessories and personal details. Think you have a Good Project that Doesn't fit our typical requirements?